He was born on 21-4-1956 at Trichur. He has the educational qualifications B.Th. and DOCL from Rome. He had his priestly formation at Vadavathoor. After his ordination in 21-12-1980, he served as Asst. Vicar, Aranattukara (1981), Fr. Prefect, Minor Seminary (1982), Vice Chancellor of Curia (1988), Vice Rector of Minor Seminary (1991), Director of DBCLC and Catechism (1992-1995), Chancellor and Eparchial Judge (1995-2000) First Rector of Mary Matha Major Seminary (1998-2007); Syncellus and Protosyncellus (2007+). He has been instrumental in developing the Mary Matha Major Seminary. 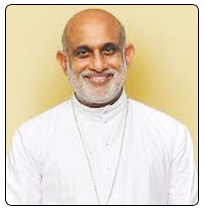 He was appointed Auxiliary Bishop of Trichur and Titular Bishop of Buruni on 18 January 2010 and was ordained bishop on 10 April 2010.